← Wrong Question: can fracking be done safely? Thanks to Twitter, I was made aware of a recent US report, entitled “Coastal impact, Adaptation and Vulnerabilities”. A summary of the report is here: http://www.usgs.gov/newsroom/article.asp?ID=3496#.USVxRFc-6OJ. What caught my attention on that page was the ‘before and after Hurricane Sandy’ photograph of Mantoloking, New Jersey. They are telling images and we have seen a lot of them in the aftermath of hurricane Sandy and other storms. People seemed genuinely surprised at the amount of sand that was moved landwards by the hurricane (in addition to whole buildings that were taken off their foundations and moved about). These images never cease to amaze me, if only because of the continued dogged persistence by people to build so close to the ocean. This is not a treatise on barrier island formation. I just use the occasion to share a set of my own photographs. Hurricane Katrina struck the northern Gulf of Mexico on August 28/29, 2005. 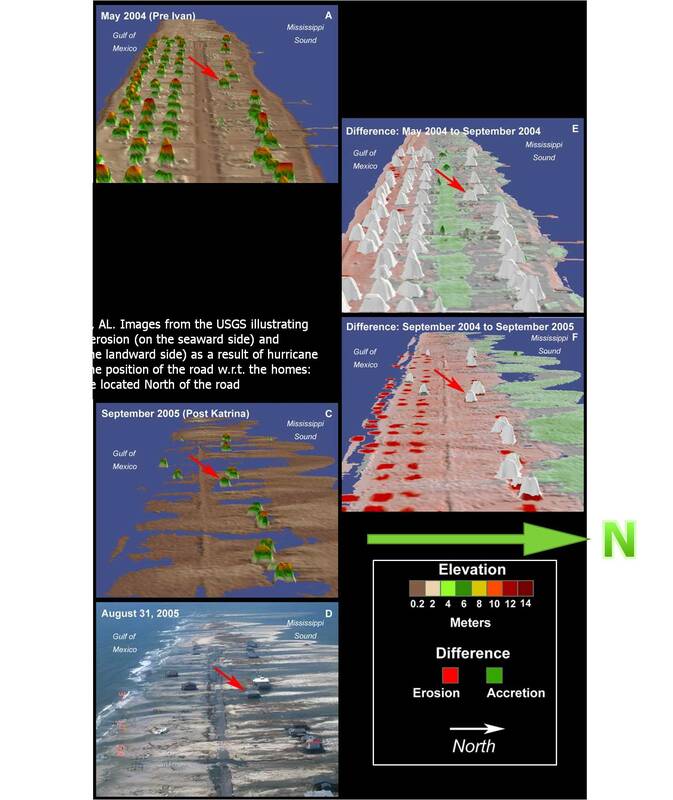 One of the key research areas for barrier island erosion is Dauphin Island (Alabama) and the USGS and NOAA (the same two organizations responsible for the above cited report) published excellent imagery of Dauphin Island, showing how the hurricane had moved a whopping amount of sediment from the seaward to the landward side of Dauphin Island. This is an image of part of Dauphin Island shortly after Hurricane Katrina. The wash overs are clearly visible. Note the position of the road: most houses (these are all vacation homes) are located on the landward side of the road. 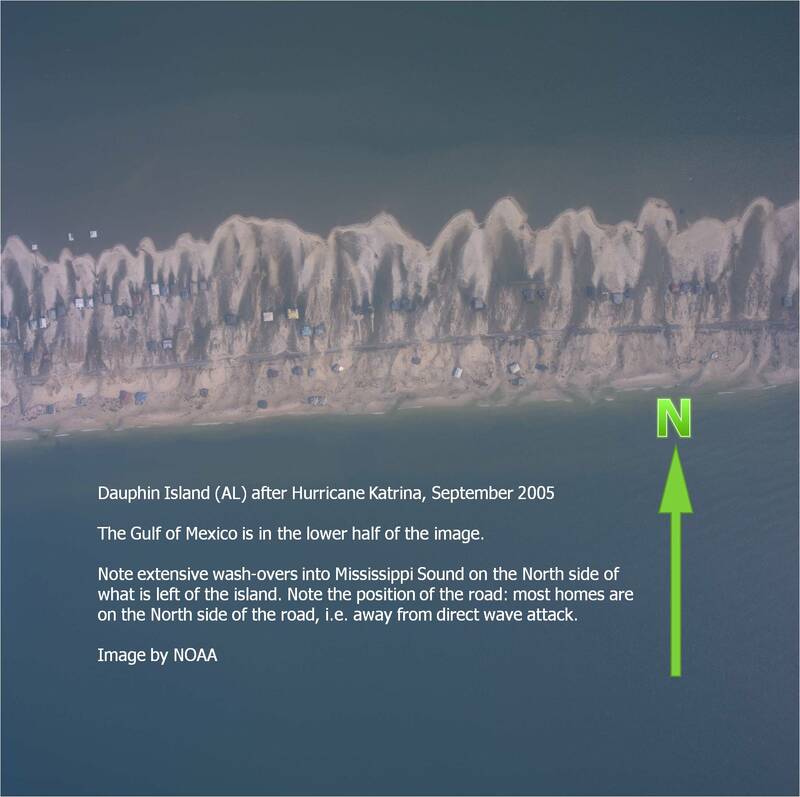 This is an image compiled by the USGS, showing differential erosion and accretion on Dauphin Island, as a result of Hurricane Katrina. A transgressive system in action. 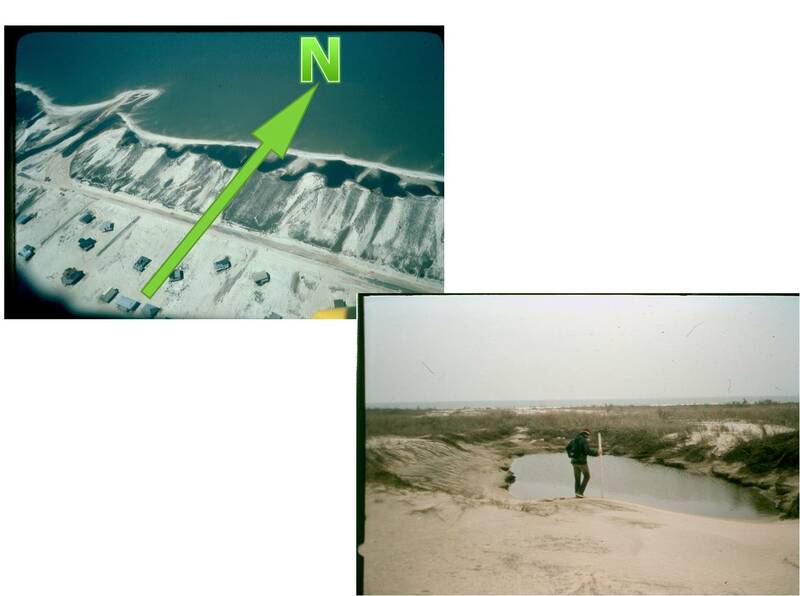 These are two images from my 2 days of field work on Dauphin Island in March of 1980. The aerial photo shows identical wash overs, but note the position of the road with respect to the homes! Most homes are on the seaward side of the road………….. Did the road move? NO! The road stayed in the same location; rather, as a result of a number of hurricanes that affected the island over a period of 25 years, homes were destroyed and moved rebuilt further landward. This is an anthropogenic transgressive system in action! Can we call this an ingredient of the Anthropocene? The field photo shows the depth of the scour by these hurricane wash overs: the man in the photograph is ca. 6 ft (1.80 m) tall. I do wish Canada would produce similar systematic reports as well. This entry was posted in General geoscience and tagged barrier islands, climate, coastal zone management, earth science, environment, geoscience, Holocene, natural disaster, natural hazard, Sea Level, sedimentology, shelf margin, transgression. Bookmark the permalink.